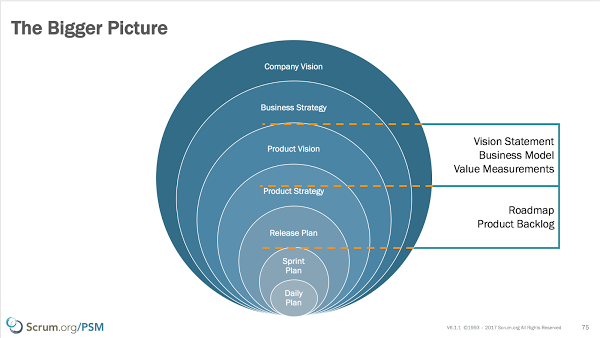 Scrum is intended as a simple, yet sufficient framework for complex product delivery. 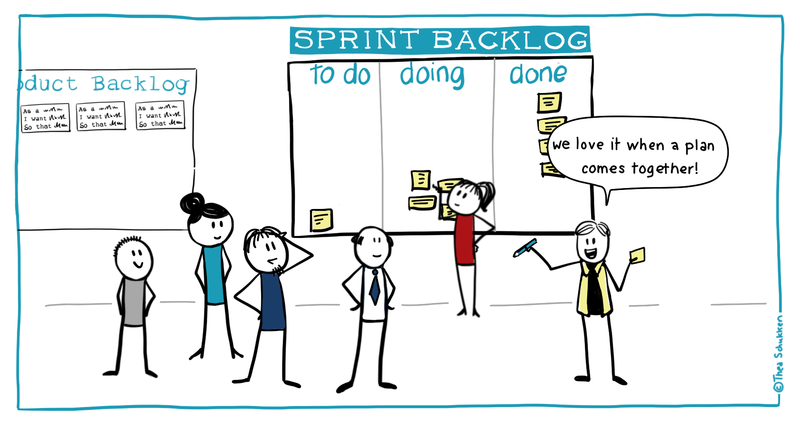 Scrum is not a one-size-fits-all solution, a silver bullet or a complete methodology. Instead, Scrum provides the minimal boundaries within which teams can self-organize to solve a complex problem using an empirical approach. This simplicity is its greatest strength, but also the source of many misinterpretations and myths surrounding Scrum. In this series of posts we — your ‘mythbusters’ Christiaan Verwijs & Barry Overeem — will address the most common myths and misunderstandings. PS: The great visuals are by Thea Schukken. Check out the previous episodes here (1, 2, 3, 4, 5, 6, 7, 8 and 9). Today we bust one of the more radical myths in Scrum; the belief that plans and planning have no place in Scrum. This myth surfaces in many different ways. One example is a Scrum Team that developed a strong aversion to the words ‘plan’ and ‘planning’, proudly proclaiming that ‘we don’t create plans in Scrum’. Another example is a Scrum Master that refused to have the Scrum Team even consider what might happen in upcoming Sprints. Yet another example is the belief that Scrum Teams aimlessly build products without having an overarching goal or sense of direction. In a more subtle way, the myth also surfaces when Scrum Teams work with more traditional teams or departments that require “plans”. Simply stating that “we don’t use plans in Scrum” is not helpful. We are aware that this myth has already been addressed quite a few times — most recently by Stephanie Ockerman from Scrum.org. But we feel that it is important enough to address it again in this series. Scrum is a simple, yet sufficient framework for complex product delivery. It describes only the minimal boundaries. Although Scrum does not describe how product planning should be done in detail — other than expressing it in an ordered Product Backlog — this does not mean that there is no product planning in Scrum. When working with departments or teams that require plans, e.g. a marketing plan or a testing plan, don’t reject them out of hand. Help them understand that product development is highly unpredictable, and work together to find the simplest way to plan ahead. 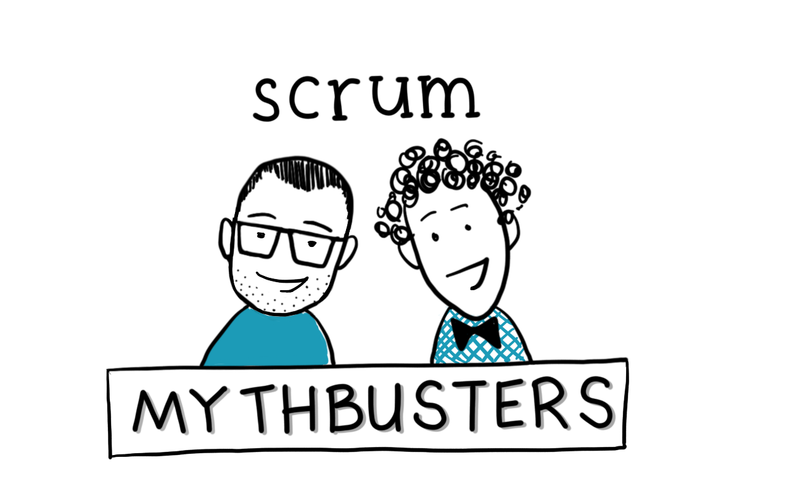 Want to separate Scrum from the myths? Join our Professional Scrum Master orScrum Master Advanced courses (in Dutch or English). We guarantee a unique, eye-opening experience that is 100% free of PowerPoint, highly interactive and serious-but-fun. Check out our public courses (Dutch) or contact us for in-house or English courses. Check out the previous episodes here Check out the previous episodes here (1, 2, 3, 4, 5, 6, 7, 8 and 9).